Take a look at this new gallery collecting the live video clips from different songs. 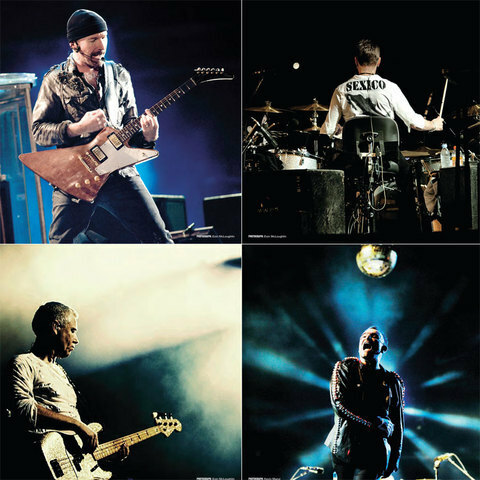 And check out these sneak preview images from the deluxe book that comes with U22. And in case you missed it, here's the tracklisting. Is it the one you predicted ? Tell us what you think in the comments below. I thought One Tree Hill from the Joshua Tree sounded great, untill I heard this live version... They took the song to a new level, amazing!! Hey,can anyone tell me where "Where the streets have no name" was recorded for the U22 cd.Thanks. We only have two from the new album. This should carry the essecnce of the tour. Missing out on Boots, Breathe, and No Line leave it a bit out of date. Still missing Vertigo, one of the better live performances they do these days. And if it's for the die-hards, Still Haven't found and One could do without. But some great additions like Zooropa, Even Better, and Ultraviolet. This is gonna be a good album but its a shame that the new songs aren't on it! would have liked to have seen Breathe, and In a little while! aswell as Go crazy then leading into sunday bloody sunday! My album would have been completly different to this, not just the same songs weve got live from U2 go home and zoo tv tour. i agree breath was fantastic live. The 360tour was fantastic and I hope it's not too long before they come to glasgow again, I have been a fan since the war album and been hooked ever since. Best live band as far as i'm concerned. Thanks U2. La versione di With Or Without You in U22, è talmente bella che non riesco a fermarmi di sentirla. Non poteva essere scelta miglior canzone!!! U2 COME BACK TO ARGENTINA!!!!!!!!!!!!!!! Acabo de descargar mis canciones, buenísimas!!! Gracias U2!!! Thank you U2 from Brazil!!! It was magnificent to be a part of 360 gigs both nights in Zagreb! Then I went to Seattle and it was a special night too (have a very good DVD from this one!)... U22 is a best fan club release to date, definitely. Guys, don't forget to come back to Croatia next time - I believe 100.000 fans would appreciate it very much. Again. To have these live tracks arriving any day from now is, for me, a dream come true. I never had the chance to see you guys live so I hope your still going to do more tours in the not so distant future... Just downloaded my 8 tracks and I love them.. Absolutely stunning! Thank you U2! My 8 U22 Tracks are available now for download. Thankyou !! Ït's an amzing CD. There's no bad song on it. U2.com thanks. But Unknown Caller should be on it. But o.k. as a missing track I downloaded it ofcourse. What an amazing song that is that day at Wembley Stadium. One of the finest tracks they played on the tour. My fav. of the cd is One Tree Hill. It can't be better I think. After so many years eventually this song is on a live cd of U2. It was my missing track. Maybe together with The Unforgettable Fire. Also great. Overall great recordings and well chosen. I hope it will soon arive at my home in Amsterdam. I understand people being dissapointed that some songs weren't selected, but it was U2.com members who made the choice. I'm glad that there was the effort to involve us in what songs went on CD. Democracy in action!!! I Found What I Was Looking For and It's Hugh Masekela!!! cvstahl, I politely disagree with you, "that trumpet" you speak of sets this performance apart from the same performance (generally speaking) that has been available for years. This new spice and flavor added to the song is the most exciting sound I've heard since Rattle & Hum's experiment with The New Voices of Freedom gospel choir. Much welcomed, and I can't believe that I originally voted against it... Oops! On the 360 Tour, our fab 4 played a number of NEW songs live that remain currently 'unreleased'... no previous recordings... now, boys and girls, wouldn't THAT be a fantastic CD to have... ??? May 14th, my first U2 concert, just a few weeks before my birthday, and I was really excited to go the concert. The Estadio Azteca looks spectacular, in the field The Claw!!! The most impressive concert of my entire life. Can´t wait to receive this awesome compilation.